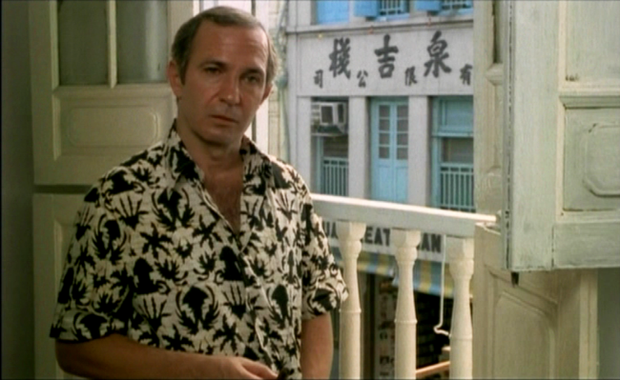 Saint Jack (1979) by Peter Bogdanovich can claim the title of being the first Hollywood movie to be filmed entirely on location in Singapore. It was also famous for another reason - it was banned for decades by the Singapore government because of its unsavoury portrayal of the nation-state in the 1970s. You can watch it on either 7 January or 4 February, as part of the Asian Film Archive's 'State of Motion 2017' (SOM) screening series of old films that present a side of Singapore we may never see again. 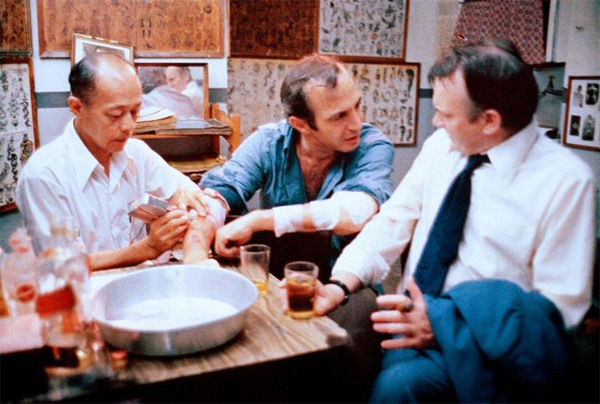 As a savvy American pimp trying to make his fortune in Singapore, Jack Flowers oscillates between the hot humid world of the Chinese triads and the sordid opulence of his Western customers. Adapted from a 1973 novel by Paul Theroux, the film essentially depicts a man’s desire to forge a reasonably honorable life in a dishonorable profession. Saint Jack is one of 5 films featured in State of Motion 2017. We spoke to writer Ben Slater about 'Saint Jack'. Ben represents the 'authority' in terms of any kind of information about the film. He has published a book 'Kinda Hot', a book on the making of 'Saint Jack' (set in Singapore) and has also written extensively about Singapore films. How did you come across Saint Jack? I first came to Singapore in 1998. I was doing a performance theatre piece with a company called Spell#7. Part of the inspiration for the theatre piece, which is about a stranger arriving in Singapore, was Saint Jack. I hadn’t read the book or seen the film at the time. The reason it was on people's minds is because it had just been shown in the Singapore International Film Festival the year before in 1997. That was the first time that Saint Jack was shown in Singapore officially. So everyone told me about it and I actually had heard of the film because I am something of a film buff. I had actually read a bad review of it in a film guide that I had, and got into my head that it wasn't a very good film. But now I was curious having been to Singapore and seen the place. I wanted to find out more about the film so I read the book because I couldn't see the film. There was no VHS tape copy and certainly no DVD of it. You know, I didn’t know anyone that had a copy so it was basically impossible to see at that point. All I could do was read the book and when the DVD copy was produced in America I ordered it from Amazon as soon as I found out about it. And then I watched it. I was working at the cinema at the time so I was able to project the DVD on the screen. And I watched it with my girlfriend who is now my wife, who is Singaporean, and we were amazed by it, absolutely blown away by it. What is the allure of Saint Jack for you as a researcher? It really came out of my coming to Singapore, visiting Singapore, beginning a relationship with Singapore. And then being obsessed and interested in film and bringing those two things together. I never looked at it as a researcher. Initially I was just somebody who loved film and loved this idea that this film would be made in Singapore with all these very famous people in it that nobody really knew about. I think that that began to make me very curious about the film and the fact that it was banned. It was very easy to find out, at least, the piece of information that the film had been shot in secret under a different title. That obviously made me really curious and have hundreds of questions about how they were able to get away with it and how it all happened. That's how I approached it, I wasn't seeing myself as a researcher but more as somebody who wanted to solve a mystery about how this film came to be. What would you consider to be Saint Jack’s place in Singapore film history; is it an outlier considering the secrecy around its production and its subsequent banning? I don’t think the film is an outlier because it was banned or because it was filmed in secret. I mean it is an outlier. If you consider it as a part of Singapore film history it's certainly an outlier mainly because it's made by outsiders and it's an outsider’s story. I don't think anybody would pretend anything else so we can't really talk about it as a Singaporean film in a literal sense. There have been those who have argued that it is kind of a Singaporean film in the sense that it was telling a story that was very specific to Singapore. It was also encountering some of the sort of censorship issues that are, you know, very specific to Singapore as well. But for me there is a tradition, a kind of parallel tradition of foreign films, international films, shot using Singapore as a backdrop or as the location. Saint Jack is the very best of them. You know, it really is. It's unique in the sense that it's the only one of those that I think really captures the place. The people involved in it spent time in the place and got to know the place, albeit not months and months but a reasonable amount of time. About 6 months actually. And I think if you're talking about the history of Singapore film, I think it’s important to look at Saint Jack. Certain Singaporean filmmakers have watched it and been aware of it and not necessarily have it as an influence, but something that they’ve liked and that they’ve been responding to. What particularly struck you about the film the first time you watched it? The thing that struck me particularly watching it was the fact that it was very obvious that there's almost no professional actors in the film. [Other than] Ben Gazzara and the 4 or 5 actors that played the British. Denholm Elliott as well. There are a couple of local performers who had some experience. But almost everybody else has never been in a film before, and quite a number people never acted before, certainly not on a professional level. There are some amateur performances in it, but nobody professional. What I especially loved about it was the way that that was so seamless. This combination, what we called non-actors working with professional actors in a completely open, easy, relaxed way, often that can be a disaster. That can not work. And it's obvious that people are confident, or they’re a bit nervous or are a bit shy, and then the professional actors stand out a very different kind of way. But I don't think that it was the case with Saint Jack and I think it mirrored [the way] the whole thing had a very relaxed vibe to it. Like everybody was kind of having a good time while they were making it. And there was a very easy feeling between the local cast and crew, or those local cast on screen, and the sort of interlopers, the outsiders. It all felt very lived in, kind of real and textured. Any memorable moments, characters or scenes? There are so many memorable moments. I've watched the film dozens of times so it's really hard for me to pick specific moments that I love. There's almost something in every scene that I love because I've seen it so many times. I spot tiny details that other people might not spot. I can see the way there’s a lot being crammed into the film, a lot of moments and bits of information that are there and a lot of bits that are almost accidental. Bits of stuff that just happened to be around that they were filming, like a can of Milo, or the name of the band that was playing at the Hilton hotel that night when they filmed the sequence where they go to the Hilton. You know, all kinds of bits and pieces like that. I think one of my favorite moments in the film, which is a kind of throwaway moment in some ways, is just after Jack Flowers (Ben Gazzara) has left Denholm Elliott's character William Leigh in the hotel room at Raffles. And there's a 5, 10 second shot of Jack walking along the corridor in Raffles hotel with the windows in the background that look out onto the harbour. We can kind of hear the boats in the harbour and it's around sunset time, evening. It's really atmospheric and moody. It doesn't advance the story any way at all, but it tells us a lot about the state of mind of that character and how he's thinking about life and death. Favorite bits of trivia about the film? One of my favorite bits of trivia about the film since you're asking, is when Pierre got hauled to the Ministry of Culture. They were panicking at that point because they thought, well that's it, they rumbled us, they know that we're making Saint Jack and we’re all going to get kicked out the country. And they just said to him: well actually, you owe all of the CPF money. They didn’t have a clue about CPF, no one had really advised them properly but they had been caught out. They were being put on the spot. They were given a huge bill to pay the government CPF for all the people who they employed on the film. So they had to go and find a lawyer that could negotiate and get the money down, and tell them what was really going on in terms of what was legal or not legal about this whole business. And the lawyer was David Marshall, which seems kind of staggering to think that he would be the person in charge of that.